Norwegian writer Jørn Lier Horst (b. 1970) and illustrator and animator Hans Jørgen Sandnes (b. 1979) have together created the bestselling children’s book series Detective Agency No. 2 for ages 6-9. Jørn Lier Horst has won multiple awards for his crime fiction for adults, and is also the author behind the highly praised CLUE series for children aged 9-12. Horst’s ability to create charming and believable characters has resulted in a rich universe full adventure and mystery. 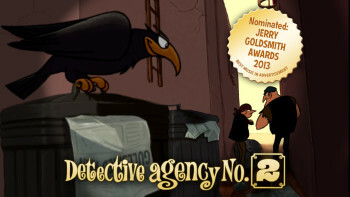 Together with Hans Jørgen Sandnes’ award-winning illustrations, the Detective Agency No. 2 series’ universe and its lovable young detective duo are brought to vivid life before the reader. Set in the idyllic small town of Riverton, the Detective Agency No. 2 series follows the adventures of our main protagonists Tiril and Oliver – not to mention their dog Ocho! Together the two young detectives collect evidence, search for connections, and join the at times perilous hunt for criminals. Concluding each book is an afterword in which readers can put their own sleuthing skills to the test. The bestseller list for the most sold Norwegian children’s books in Norway 2018 has been announced, and Jørn Lier Horst & Hans Jørgen Sandnes’ Detective Agency No. 2 series dominates the list and occupies an impressive thirteen out of fifteen placements. Starting with Operation Mummy at No. 2, the books featured are the following: Operation Pirate, Operation Summer Island, Operation Ghost, Operation Shadowman, Operation Circus, Operation Thundercloud, Operation Shipwreck, The Search for the Queen of the Jungle, Operation Windblast, The Search for The Thief’s Thief, Operation Junk Thief and Operation Daffodil. Jørn Lier Horst again nabs two of the top five spots on the official list for most sold children’s books in Norway this February. Horst & Hans Jørgen Sandnes’ Operation Sable Forest, the fifteenth Detective Agency No. 2 book, comes in first at No. 1. It’s followed by the thirteenth book in the CLUE series, The Smuggler’s Shack, which comes in at No. 4, staying put at the same position also this month. Jørn Lier Horst & Hans Jørgen Sandnes’ new Detective Agency No. 2 title, Operation Sable Forest, claims the No. 1 spot on the official weekly hardcover bestseller list in Norway. Operation Sable Forest is the fifteenth title in the series. Jørn Lier Horst nabs two of the top five spots on the official list for most sold children’s books in Norway this January. Horst’s thirteenth book in the CLUE series, The Smuggler’s Shack, comes in at No. 4. It’s closely followed by Horst & Hans Jørgen Sandnes’ Operation Junk Thief at No. 5. Jørn Lier Horst & Hans Jørgen Sandnes’ Operation Sable Forest is the fifteenth installment in their Detective Agency No. 2 series - crime fiction for the youngest! Jørn Lier Horst & Hans Jørgen Sandnes occupy two of the top five spots on the official November bestseller list for children’s books in Norway. At No. 2 is the duo’s new Christmas-themed short activity book, The Search for the Green Mitten. At No. 3 is Operation Junk Thief, the fourteenth book in Detective Agency No. 2 the series. The official children’s books bestseller list for October is out, and the newest title in Jørn Lier Horst’s & Hans Jørgen Sandnes’ Detective Agency No. 2 series, Operation Junk Thief, claims the No. 3 spot. Bobbie Peers’ fourth children’s book, William Wenton and the Apocalypse Generator, comes in at No. 5. Operation Junk Thief, the fourteenth installment in Jørn Lier Horst & Hans Jørgen Sandnes’ Detective Agency No. 2 series, is now out in Norwegian bookstores! Jørn Lier Horst & Hans Jørgen Sandnes’ Detective Agency No. 2 series once again tops the monthly bestseller list for childrens’ books in Norway. Operation Shipwreck - the thirteenth book in the series - is No. 1, and The Search for the Castle’s Secret comes in at No. 2. Jørn Lier Horst & Hans Jørgen Sandnes dominate the June/July bestseller list for Norwegian children’s fiction, claiming a staggering thirteen out of fifteen spots on Bok og samfunn’s list. The bestselling titles are, in order, Operation Pirate at No. 1, Operation Mummy at No. 2, Operation Summer Island at No. 3, The Search for the Castle’s Secret at No. 5, Operation Shipwreck at No. 6, Operation Ghost at No. 7, The Search for the Queen of the Jungle at No. 8, Operation Circus at No. 9, Operation Shadowman at No. 11, Operation Thundercloud at No. 12, Operation Windblast at No. 13, Operation Sunset at No. 14, and Operation Bronze Square at No. 15. The top of the July list for most sold children’s books in Norway echoes that of the June list: Jørn Lier Horst & Hans Jørgen Sandnes still occupy the top two positions, coming in at No. 1 with The Search for the Castle’s Secret and No. 2 with Operation Shipwreck. Jørn Lier Horst & Hans Jørgen Sandnes’ Detective Agency No. 2 tops also the June bestseller list for children’s books. At No. 1 is the latest activity book in the series, The Search for the Castle’s Secret, and at No. 2 is Operation Shipwreck. The thirteenth book in the Detective Agency No. 2 series, Operation Shipwreck, tops yet another monthly children’s bestseller list and comes in at No. 1 also on the May list. The just published The Search for the Castle’s Secret - the fourth activity book in the series - is No. 3. Jørn Lier Horst & Hans Jørgen Sandnes’ Detective Agency No. 2 series tops the monthly children’s books bestseller list also in April. On the official Norwegian list, Operation Shipwreck comes in at No. 1. It’s closely followed by Operation Mummy at No. 2. Jørn Lier Horst & Hans Jørgen Sandnes dominate the February/March bestseller list for Norwegian children’s fiction, claiming a whopping ten out of fifteen spots on Bok og samfunn’s list. The bestselling titles are, in order, Operation Daffodil at No. 1, Operation Shipwreck at No. 2, Operation Shadowman at No. 3, Operation Ghost at No. 4, Operation Bronze Square at No. 5, Operation Circus at No. 6, Operation Thundercloud at No. 7, Operation Windblast at No. 8, Operation Sunset at No. 10, and Operation Plastic Bag at No. 13. March’s list of the most sold children’s books in Norway is out, and Jørn Lier Horst & Hans Jørgen Sandnes once again feature heavily at the top. At No. 1 is their most recent Detective Agency No. 2 book, Operation Shipwreck. Operation Mummy comes in not far after, at No. 4. Finally, at No. 5, is Jørn Lier Horst’s The Triangle Mystery, the twelfth CLUE book. The most sold children’s books of February in Norway have been announced, and Jørn Lier Horst emerges as the clear winner by claiming all top three spots on the list. At No. 1 is his and the illustrator Hans Jørgen Sandnes’ Operation Shipwreck, the thirteenth Detective Agency No. 2 book. It’s followed by The Triangle Mystery at No. 2, and Operation Mummy at No. 3. Jørn Lier Horst & Hans Jørgen Sandnes’ Operation Shipwreck climbs to No. 2 on the official list for hardcover fiction in Norway. Operation Shipwreck is the thirteenth installment in the Detective Agency No. 2 series. The list of children’s books with the highest in-store sales in January is now official, and Jørn Lier Horst is the undeniable winner! A staggering 11 out of 15 books on the list are titles by Jørn Lier Horst, either from his CLUE series written by him alone, or his Detective Agency No. 2 series, in which he’s paired up with illustrator Hans Jørgen Sandnes. Starting at No. 2, the titles featured on the January in-store sales list are: The Triangle Mystery (No. 2), Operation Ghost (No. 3), Operation Circus (No. 4), Operation Windblast (No. 5), Operation Sunset (No. 6), Operation Mummy (No. 7), Operation Shadowman (No. 8), Operation Plastic Bag (No. 10), Operation Thundercloud (No. 12), Operation Bronze Square (No. 13), and the short activity booklet The Search for the Abominable Snowman (No. 15). Putting his own mark on the list is Bobbie Peers, who snatches two spots with his action-packed adventure series about William Wenton. The third and latest installment, William Wenton and the Orbulator Agent, claims the No. 9 spot, and the second book in the series, William Wenton and the Cryptoportal, the No. 11 spot. Operation Shipwreck, the thirteenth installment in Jørn Lier Horst & Hans Jørgen Sandnes’ Detective Agency No. 2 series, is now out in Norwegian bookstores! A violent storm has washed up the remains of a shipwreck on Riverton’s shores. Among the debris, Tiril and Oliver find evidence of a pollution scandal. But there’s also something that points to the existence of an old shipwreck just outside Riverton. It’s a new case for Detective Agency. No. 2, and this time they’ll not only have to dig deep, but dive deep, to find the truth! The official January bestseller list for children’s books in Norway is in, and Jørn Lier Horst makes a double appearance at the top. At No. 1 is his latest book in the CLUE series, The Triangle Mystery. It is closely followed at No. 2 by Operation Mummy, the twelfth book in the Detective Agency No. 2 series by Jørn Lier Horst & Hans Jørgen Sandnes. Claiming the last spot on the podium is Bobbie Peers’ third William Wenton novel, William Wenton and the Orbulator Agent, at No. 3. Jørn Lier Horst & Hans Jørgen Sandnes’ Detective Agency No. 2 series makes a strong showing on the December 2017 bestseller list for children’s fiction, claiming five of the top 20 spots. Operation Mummy, the latest installment in the series, claims the highest position of the five, coming in at No. 3. It’s followed by a short activity booklet called The Search for the Abominable Snowman at No. 4, and a bit further down on the list comes the Detective’s Handbook, The Search for The Thief’s Thief, and Operation Pirate. Bobbie Peers also makes a repeat appearance on the list, climbing to No. 5 with William Wenton and the Orbulator Agent, the third William Wenton book. The official November bestseller list for children’s fiction in Norway has been released, and Jørn Lier Horst & Hans Jørgen Sandnes come in at No. 2 with their Operation Mummy, the twelfth installment in the Detective Agency No. 2 series. Bobbie Peers’ third William Wenton book, William Wenton and the Orbulator Agent, claims the No. 5 spot. Operation Mummy, the new glow-in-the-dark book from the Detective Agency No. 2 series, claims the No. 1 spot on the official Norwegian bestseller list for the month of October. Operation Mummy is the twelfth installment in the Detective Agency No. 2 series. Jørn Lier Horst dominates the September bestseller lists in Norway, coming in at No. 1 on the bestseller list for fiction as well as for children’s fiction. On the fiction list it is Horst’s The Katharina Code that claims the No. 1 spot, while it’s the Detective Agency No. 2 series by Jørn Lier Horst and Hans-Jørgen Sandnes that occupies the majority of the positions on the children’s list. At No. 1 is Operation Ghost, No. 2 Operation Circus, and at No. 5 comes The Search for Captain Krogh’s Gold, the first activity book of the series. Detective Agency No. 2’s Detective’s Handbook is chock-full of pointers and advice on how to become an expert detective, teaching you everything you need to know so that you too can begin solving mysteries! What is the first thing you need to do when solving a mystery – have you ever wondered? How do you look for clues? And how do you lift fingerprints? There’s no age limit to being a detective. The key to uncovering evidence and finding information is all about being curious, inventive and observant. Besides which there are a whole bunch of clever methods and techniques you can use. All of which you can learn here, in the Detective’s Handbook. Operation Mummy, the twelfth and newest installment in Jørn Lier Horst & Hans Jørgen Sandnes’ Detective Agency No. 2 series, is No. 5 on the official Norwegian bestseller list for fiction, all genres. Today is the first date of shooting for Operation Shadowman, the film based on the immensely popular and No. 1 bestselling Norwegian children’s book series by Jørn Lier Horst & Hans Jørgen Sandnes, Detective Agency No. 2. The film, which will be based on the book Operation Shadowman, will be produced by Filmkameratene in collaboration with Zefyr Media Fund. Grethe Bøe-Waal, the award-winning scriptwriter and director of Operation Arctic, has written the script and will be directing. Operation Mummy, the twelfth installment in Jørn Lier Horst & Hans Jørgen Sandnes’ Detective Agency No. 2 series, is now out in Norwegian bookstores! Jørn Lier Horst & Hans Jørgen Sandnes feature heavily on the official Norwegian list of most sold children’s books during the first half of 2017. Their Operation Pirate, the eleventh Detective Agency No. 2 book, comes in at No. 2 on the list. It’s followed by Jørn Lier Horst’s The Einstein Mystery, from his CLUE series for older children, at No. 3 and then the activity book The Search for The Thief’s Thief at No. 4. The Detective Agency No. 2 series also occupies the No. 2 and No. 3 spot on the children’s books bestseller list for July. The most recent activity book of the series, The Search for The Thief’s Thief, comes in at No. 2, and Operation Pirate at No. 3. The Search for The Thief’s Thief, the third activity book in the Detective Agency No. 2 series, is out in stores in Norway - and already No. 3 on the official bestseller list, across all categories. Jørn Lier Horst & Hans Jørgen Sandnes’ Operation Pirate continues to rule the Norwegian children’s books bestseller list, coming in at No. 1 also on the April list. Jørn Lier Horst’s The Einstein Mystery, the recently published eleventh installment in Horst’s CLUE series for children aged 9-12, comes in at No. 3. Jørn Lier Horst & Hans Jørgen Sandnes’ Detective Agency No. 2 series reigns supreme on the February bestseller list for children’s books in Norway. The top 5 positions are all occupied by books from the immensely popular series for children aged 6-9. At No. 1 is the latest and eleventh book in the series, Operation Pirate. It is followed by Operation Plastic Bag at No. 2, Operation Windblast at No. 3, Operation Daffodil at No. 4, and Operation Bronze Square at No. 5. Operation Pirate has sailed up to the No. 1 spot on the official Norwegian bestseller list. Operation Pirate is the 11th installment in Jørn Lier Horst & Hans Jørgen Sandnes’ immensely popular Detective Agency No. 2 series. The tenth installment in the series, Operation Ghost, comes in just after at No. 3. Jørn Lier Horst & Hans Jørgen Sandnes’ Operation Pirate, the eleventh book in their Detective Agency No. 2 series, is No. 3 on the Norwegian bestseller list for fiction. Operation Pirate was published in Norway this February. Operation Pirate, the eleventh installment in Jørn Lier Horst & Hans Jørgen Sandnes’ Detective Agency No. 2 series, is finally out in Norwegian bookstores! During a beachside investigation Tiril and Oliver happen across a strange, old tin platter buried deep in the sand. The platter turns out to have belonged to the notorious pirate Timian Blest, and when it is stolen just days later the detectives understand that they’re onto something big. Might the thief know where Timian Blest’s treasure is hidden? And what does the platter have to do with it? Detective Agency no. 2 will have to draw on everything they have to solve this mystery! This January the official Norwegian bestseller list for children’s books features both the Detective Agency No. 2 and William Wenton series. The tenth installment in Jørn Lier Horst & Hans Jørgen Sandnes’ Detective Agency No. 2, Operation Ghost, comes in at No. 2, and Bobbie Peers’ William Wenton and the Cryptoportal at No. 5. The tenth installment in Jørn Lier Horst & Hans Jørgen Sandnes’ crime fiction series for kids is finally here! In Operation Ghost the members of Detective Agency No. 2 are faced with their spookiest mystery to date. A girl with ghostly pale skin and deep, black eyes appears in the window of the old hunting lodge on Mount Storberget. The hunting lodge has always been surrounded by rumors of hauntings. Could the spooky apparition be “The Gray Girl,” a servant girl held prisoner in the lodge’s cellar long, long ago? It will take Detective Agency No. 2 to solve this mystery! Jørn Lier Horst and Hans Jørgen Sandnes’ The Search for the Queen of the Jungle is this summer’s most sold children’s book in Norway. The activity book, which features the gang from the Detective Agency No. 2 series, is joined on the list by a book from the original series, Operation Circus. The ninth installment in the series, Operation Circus keeps its No. 3 spot from last month’s list. Jørn Lier Horst and Hans Jørgen Sandnes' The Search for the Queen of the Jungle is currently No. 2 on the Norwegian bestseller list of children's fiction. Following at No. 3 is Operation Circus, the tenth book in the Detective Agency No. 2 series. Jørn Lier Horst & Hans Jørgen Sandnes’ crime fiction series for children, Detective Agency No. 2, is headed for Finland! Finland will be the 13th country the crime solving trio of Tiril, Oliver and Ocho make their debut in. Detective Agency No. 2 and the city of Riverton come to vivid life in this animated trailer for the children’s detective series by Jørn Lier Horst & Hans Jørgen Sandnes. Created by the talented Sandnes - the illustrator half of the author duo - the trailer gives a sneak peek at the series’ lushly imaginative universe and thrilling adventures! Detective Agency No. 2 on a dangerous mission in the jungle! Grandpa Franz, a seasoned explorer and adventurer, has gone to Africa to find the Queen of the Jungle. That’s all Tiril and Otto know about it until they get a secret message from Grandpa asking for their help. But where is he? And what on Earth is the Queen of the Jungle? In Jørn Lier Horst & Hans Jørgen Sandnes’ second activity book for children, The Search for the Queen of the Jungle, the reader is invited to join Detective Agency No. 2 on a breathless chase through the jungle while the mysterious Toffen Gang is hot on their heels. Help Tiril and Otto solve the mystery and find Grandpa Franz by joining the hunt for evidence, following clues, and solving puzzles. Jørn Lier Horst & Hans Jørgen Sandnes’ Operation Circus, the ninth book in their Detective Agency No. 2 series, is No. 1 on the Norwegian bestseller list of children’s fiction.